We treasure the cuisines and the cultural backgrounds of Japan and Italy and take a global perspective on the food cultures of the world. Originating in Italian cuisine, our Tasting Menu presents richly creative dishes crafted from a range of techniques by a masterful chef whose skills were acquired through overseas experience and whose creations are accompanied by wines carefully selected by connoisseurs. In addition to the restaurant, we offer a sophisticated day lounge, Supper & Bar Time, for diners. After culinary training in Italy, Taku opened a restaurant in Hamburg, Germany. After launching two food establishments where Taku served as the chef, Taku returned to Japan for my next challenge. Moving back to Japan for the next stage of his career—Taku’s hometown is Tokyo—after an absence of 15 years, Taku became involved in the launch of s’accapau as a way to express the ideas Taku cultivated during my time overseas. While reflecting global food cultures and techniques into the latest projects of Delicious-Links Inc., as a creative chef, Taku is responsible for recreating diverse cultures. As a chef, Taku studied basic Italian cuisine for five years in Osaka, Japan. 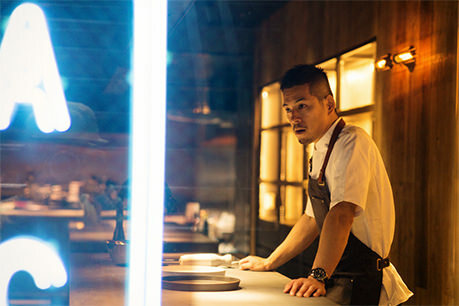 At the age of 23, Taku went to Italy to train in restaurants around the country for six years. At the age of 30, through a joint investment, Taku opened the Italian restaurant, I Vigneri, in the German city of Hamburg, and served as the restaurant’s chef. Three years later, with the same business partner and again in Hamburg, Taku opened Caffe I Vigneri selling food (produce) from all over Italy. AND PRODUCE FROM DIFFERENT REGIONS.